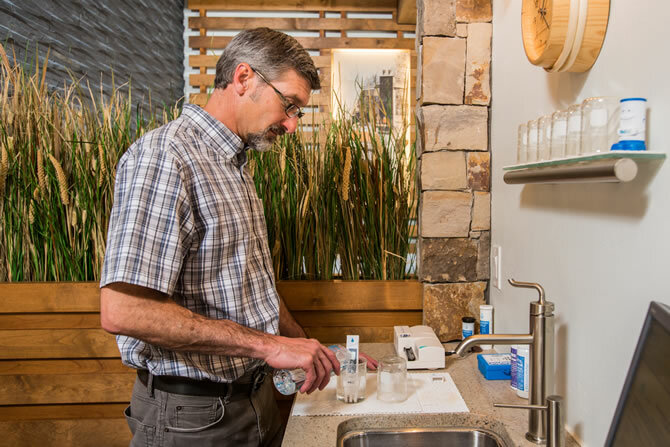 Our water analysis service is offered as a way to help you maintain your spa water in a clean, clear, and safe condition. As a spa or chemical customer of Aqua Vita Spas, you are welcome to bring a spa water sample in once a month for a complimentary water analysis. This complimentary service is reserved for those that observe the following conditions. Our water lab service is for testing spa water only. NO EXCEPTIONS! You are maintaining your spa water chemistry with SpaGuard Spa Products purchased from Aqua Vita Spas. You do NOT add a significant amount of chlorine, bromine, or spa shock to your spa water within 12 hours of drawing a water sample to be tested. Sample water must be in liquid form when brought to the lab. We cannot test frozen water or vapor. If you desire to use our water lab service more than once per month, or you purchased your spa elsewhere, a lab fee will be charged. Lab fees must be paid at the time of service. Lab services cannot be billed to an account.